Meadow View Barn sleeps up to 5 in 2 bedrooms with a large open plan living space. The Shippens is a larger 3 bedroom property with ensute to the main bedroom. Sleep up to 7. The barns can be rented together for a total of 11 beds. Accommodation includes a modern open plan living space with large oak windows and French doors that open onto a courtyard garden. Upstairs are 2 characterful bedrooms with exposed beams and Velux windows, there is also a modern family bathroom with a powerful shower over the bath. The barn is south facing and has a gravel courtyard the garden that gets sunshine all day and into the evening. There is a table and chairs on a patio with seating for 4, perfect to unwind in the evening and take advantage of the charcoal BBQ. The garden has a small picket fence with a secure latching gate. There is a dedicated off road parking space for one car. Meadow View Barn and The Shippens were converted in 2007 to give a modern relaxing environment retaining the character of the original structure. The barns are located in Over Compton, a quiet village about 3 miles from Sherborne and it’s wonderful Cathedral, old streets, individual shops and restaurants. There is a fantastic members only gourmet food and wine store a short walk from the barns, and local village pub just half a mile walk. There is an award winning pub/restaurant (The Rose and Crown Trent) just 1.5 miles away. The barns are in the perfect location to explore Dorset, either inland or the coast just a short drive away. There is a local train service to the City of Bath or Weymouth seaside. We have owned Meadow View Barn for 7 years and have just purchased The Shippens (March 2016). Meadow View Barn sleeps up to 5 in 2 bedrooms with a large open plan living space. The Shippens is a larger 3 bedroom property with en-suite to the main bedroom, Sleeping up to 7. The barns can be rented together for a total of 12 beds. We have furnished the barns to a high standard with good quality furniture and bed linen. The kitchens are well equipped with good quality appliances. We welcome families of any age and can offer travel cots, high chairs and stairgates on request. The prices include electricity, WiFi, 100% Cotton bed linen and a welcome basket. There are 40" SMART TVs, Wii games console and Superfast WiFi. The barns are south facing and have gravel courtyard the gardens that get sunshine all day and into the evening. There is a table and chairs on a patio perfect to unwind in the evening and take advantage of the charcoal BBQ. The gardens have a small picket fence with a secure latching gate. There is a dedicated off road parking space for each property (The Shippens has two spaces). Family owners based in Milton Keynes, love to spend time in Dorset. We fell in love with the barn as soon as we saw it. 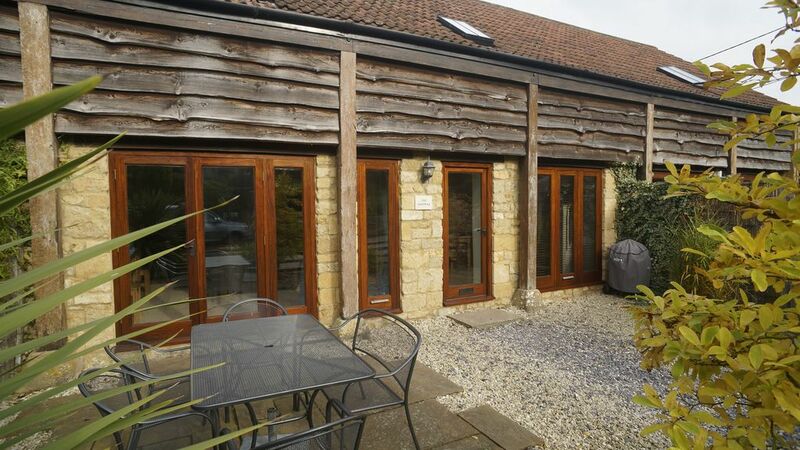 The location is a quiet village but just outside the wonderful town of Sherborne. There is a modern family bathroom with a powerful shower over the bath. It has a heated mirror and shaving socket. We provide one bath towel and one hand towel per guest. There are additional hand towels and tea towels in the kitchen and bathroom. There is a Blu Ray player in the lounge and DVD in main bedroom. The barn has a small courtyard garden with patio and seating. There is a small fence with latching gate to make it secure for young children. Notes on accommodation: The cottage also includes the benefit of membership to a fantastic members only delicatessen that has a great selection of food and wine as well as some incredible ready meals produced by them on site. This is just a short walk from the cottage through the beautiful grounds of Compton House. Compton House was previously a butterfly farm and famously produced the silk for Princess Diana's Wedding dress. Public Houses can be found in the neighbouring villages of Nether Compton, a ½ mile walk “The Griffins Head” (very traditional) and Trent 1½ miles “The Rose & Crown”, which has been recently renovated and comes highly recommended serving excellent food. Outside: Outside is a courtyard garden with a gravel surface. There is a patio with table and chairs plus a charcoal BBQ (initial charcoal and lighters provided). The barn is in a small hamlet with great walks through the grounds of Compton House and on to Nether Compton. There is a small children's play area in Nether Compton. Cleaning / Towels / Linen / Maid service: We provide bed linen, towels (one bath and one hand towel per person) plus hand towels, tea towels, oven gloves etc. We also include a welcome pack so that you can have a drink and basic kitchen items like spices and oil. Very comfortable and peaceful place to stay in Over Compton. The property was clean and tidy when we arrived, and we kept finding more things that had been provided! An airer under the bed, a washing line outside, plenty of kitchen items, etc. A nice firm, large double bed and good internet speed. The barn was great - warm, spacious, well-equipped, spotlessly clean. The location was perfect for trips to nearby villages (but the barn is so nice, you may not want to venture out too much). We had a great time on our first holiday with our three month old baby and would definitely return. The cottage was very clean and comfortable and provided everything we needed. The only slight drawback was that the wifi didn't work very well, although the owners very kindly did their best to rectify it. Dear Robert. Thank you for your feedback, we are very pleased that you enjoyed your stay. We hope you will stay at the barn again in the future. A long journey away from home with a baby can be tricky but arriving at Meadow View Barn was an absolute pleasure. The owners had set the smart new high chair and travel cot up for us in this spacious and extremely well equipped holiday home. They had even provided a few thoughtful essentials. Lovely and clean with lots of hot water and very comfy beds - all much appreciated after long busy days exploring all the fun things to do in this gorgeous area! A lot of thought and care has gone into this holiday let making it very easy to enjoy. We hope to return again sometime and would highly recommend to families. Dear Janine, Thank you so much for your feedback, we are so pleased that you enjoyed your stay at Meadow View Barn. We look forward to welcoming you back in the future. On arrival we were immediately impressed with the condition and cleanliness of the barn. Everything was as described and the welcome basket was a welcome touch especially after our long drive down from Scotland. The location of the barn is in a lovely quiet town with a pub and delicatessen nearby. The main shops for food etc can be found in either Sherbourne or Yeovil just a short drive away. One thing to note is the country road that links the main carriage way between Yeovil to Sherbourne to the barn is single lane in places with limited visibility so take care. Our kids are aged 15, 10 and 9 and our holiday plan was to be based at a peaceful location within an hours drive of the attractions we wanted to visit (Sherborne, Lulworth cove, Weymouth, West Bay, the Swanage Railway and the Bovington tank museum to name a few!) and this is exactly what we got. Overall we had a lovely holiday in Dorset and would recommend this property to anyone looking to explore Dorset and beyond. The nearest beach is in West bay about 30 min drive, or around 40 min to Weymouth. It is also possible to take the train directly to Weymouth from the local station at Yeovil Pen Mill. There is free parking at the station the train stops close to the beach in Weymouth. Meadow View Barn is situated in the village of Over Compton, a delightful hamlet located just on the Dorset side of the county border with Somerset, a few miles from the towns of Yeovil to the west and Sherborne to the east. There are great walks from the village as well as many local attractions including golf, many of Dorset’s beaches are only a 30-40min drive. There is a train service from the local station that can take you anywhere between Weymouth and Bristol including historic Bath. Booking Notes: Short stays are possible depending on availability, please get in touch to check. Our normal change over day is Saturday, this can be more flexible out of peak season so please enquire. Changeover Day: Changeover day is Saturday but can be flexible outside peak holiday times. Notes on prices: Prices shown are per week, short breaks of 3 nights or more are available from £80 per night. Short break pricing: 3 nights 65% 4 nights 75% 5 nights 80% A deposit of 25% is required at the time of booking, the remainder due 30 days before the arrival date. We require a refundable damage deposit of £100, this will be returned within 7 days of you leaving the property, normally within 24 hours. We can take payment by credit/debit card, cheque or bank transfer.